Yes, black leather in the desert is completely unbelievable. 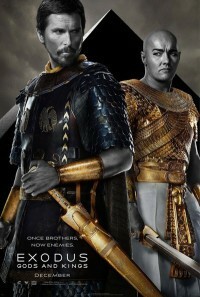 Am I the only person who liked Exodus: Gods and Kings? Having just caught up to the controversy of Ridley Scott’s big budget epic, on DVD, I’m befuddled that both mainstream and Christian audiences have orphaned this film. In his review for Forbes, Scott Mendelson, weighing in for the secular audience, commented, “Nearly all of Exodus is a routine by-the-numbers retelling of an oft-told tale with little to justify itself beyond improved special effects.” Going on, he criticized wooden acting and casting problems, the latter addressed by Scott prior to the film’s release.